Hughey Farms is proudly sponsoring AdventuresInArtInc.com next week! Ted, the owner and creator at AdventuresInArtInc.com will be coming by Wednesday, October 10 and leaving us awesome artwork he carves out of tree trunks for us all to admire. Some of the pieces will be finished and ready for YOU to take to take home and others will still be in the works. Ted is an artist and offers beautiful artwork in the form of bears, mailbox fixtures, dolphins, and whatever your heart desires! On Saturday, October 13, 2012 he will be demonstrating his art and ART it is. 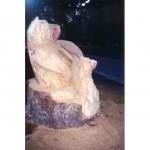 How many us could create such masterpieces with a tree stump and chainsaw? Ted will be holding demonstrations all day long on Saturday, October 13, 2012 from 9:00 a.m. to 7:00 p.m. Drop in, meet the artist, shop around, grab some apples or tomatoes and make yourself at home. You and your children will be amazed at his art! We are also pet-friendly – so just come make a day of it with us at Hughey Farms Produce!